Show Us A Better Way is a new UK government initiative that has been launched by The Power Of Information Task Force, headed by Tom Watson MP. 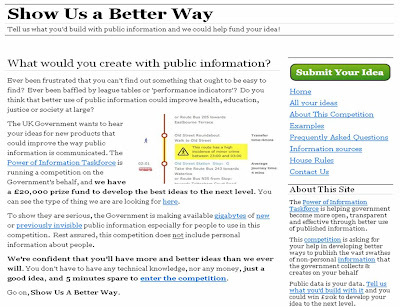 Through the http://showusabetterway.com website, launched on July 2nd, the UK government have released large amounts of government data and are running a public competition to gain ideas for ways of using it, with a prize of £20,000 for the best idea. Released data includes Ordnance Survey mapping information, medical information from NHS Choices, neighbourhood information from the ONS, official notices and a DEFRA carbon calculator. There have previously been initiatives to include the public in UK government decision making, from Ken Livingstone’s appeal for public help in reducing summer tube temperatures to Boris Johnson’s recent competition to find a new routemaster, but Show Us A Better Way aims to develop public involvement on a wider scale. The theories of Wikinomics and wisdom of crowds have found traction in private industry and since the publication of the 2005 Power Of Information report the UK government has been looking at ways of increasing public involvement in government. The speed of this has increased recently and while announcing the new ‘Strategy for world-class public services’ Gordon Brown announced that “The internet has given a powerful voice to consumers to give feedback on private-sector services - that feedback is now spreading to public services and must be embraced." The opening up of public data and progression of e-government should not be party political though. We have the technology to use government data to facilitate social progress and if things like publicly accessible crime mapping can improve quality of life then they should be pursued - and government should make it as easy as possible for this to happen. Show Us A Better Way is a good initiative, I now have to think of some ideas……….